Learning how to make a photo album is not nearly as hard as you might think. With a few simple tools from the local hobby supply store, anyone can create a beautiful photo album to share with loved ones. A simple accordion album creates a memorable gift, or serves as a simple keepsake to display on your mantle or a side table. An accordion album is the perfect solution for a handful of vacation photos, or to commemorate a single special occasion. Fold the 11 x 17 sheet of cardstock in half. Make sure the edges match up perfectly. Create a crease by running your fingertip down the folded edge. Grab the edge of the folded sheet that is facing up and fold it over backwards until the top half of the folded cardstock meets the edge and is folded in half again. Create another sharp crease. Flip the paper over and repeat, folding the other side of the paper in half again. When finished, there should be four sections that make up the accordion. Take the decorative 11 x 17 sheet of cardstock and fold around the finished accordion so that both the front and back of the accordion are covered. Mark the inside edge with a pencil before cutting down to size so that the edges match up with the edge of the accordion. Cover the surface of the back of the accordion with your glue stick and firmly press the back cover only in place. Start in the center of the page and work your way to the outer edges to get rid of any air bubbles. You may even want to use a ruler to run across the surface for a smooth fit. Do not glue the accordion to the front cover as you will want it to be loose, so the picture viewer can pull it out and look at pictures on both the front and back of the accordion. Allow the glue to dry completely for 30 minutes to an hour. Place a single hole punch about halfway up the right side of the photo album. Punch completely through all pages and the front and back cover. Cut a piece of ribbon to six inches. 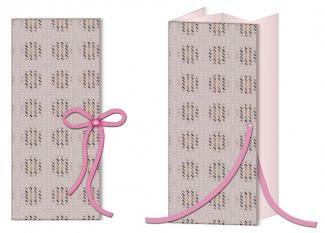 Loop the end of the ribbon through the punched hole and tie the ribbon into a bow to close the album. Open the album and use the acid-free scrapbook adhesive to glue the photos to the pages. Captions and additional decorations can be added to the interior pages, but keep bulky cutouts to a minimum or the book may fail to close properly. The look of this accordion album can be changed simply by using different papers or using wallpaper instead of cardstock for the cover. Lay the yard of material right side down on a flat surface and iron out any creases or wrinkles. Lay the three-ring binder down open on the material. Use the ruler to measure 1/2-inch out from the edge of the binder all the way around. Add an extra 1/8-inch on the right side to allow for a little extra room for opening and closing of the finished binder. Use the pencil to mark the measurements. Cut the material along the outside edge of the pencil marks. Remove the binder for now. Fold the material over 1/2-inch around and iron a crease in it. Place the opened binder back on top of the material. The material should still be right side down and the binder's inside should face up. Dispense a thin stream of hot glue along the bottom edge of the binder and pull the edge of the material up and over so that the crease fits snugly against the bottom edge of the binder. Where the three rings are located, you will need to tuck the material under the metal bar for a clean edge. Press the material firmly into place. Repeat with the top edge. Before pulling the material up over the right and left sides, lift one side of the binder so that it is only half open instead of flat open. This will give you a little extra material for opening and closing the binder. So, when you pull the material up over the right side, the left side of the binder should be lifted up at a 90-degree angle. Repeat with the opposite side of the binder. For a more professional finish, miter the inside corners. If you miter, plan an additional 1/2-inch of material along the edges. Add embellishments to the cover for a unique, personalized look. With the right photo album, you can share your pictures with loved ones while preserving cherished family memories. Homemade photo albums can save you money and provide thoughtful gifts for your family and friends.